Photo Caption: Honourable Prime Minister Sheikh Hasina inaugurated Summit's 149 MW power plant in Gazipur via video conference from her official residence, Gonobhaban. 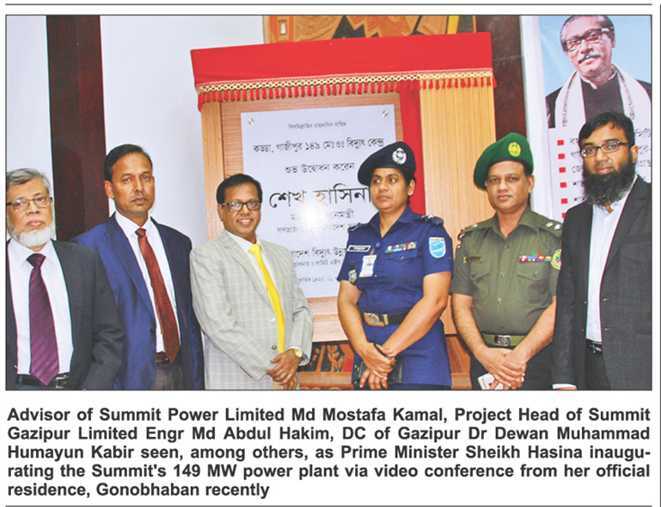 Summit Power Limited's Advisor Md Mostafa Kamal, Summit Gazipur Limited's Project Head Engr Md Abdul Hakim were present among other high officials with DC - Gazipur Dr Dewan Muhammad Humayun Kabir. Today Honouarable Prime Minister Sheikh Hasina inaugurated Summit’s 149 MW dual-fuel (Gas/HFO) based power plant Ace Alliance Power Limited. Summit’s Ace Alliance Power Limited is a joint venture of Summit Power Limited (SPL) – the publicly listed company, with 64% ownership and remaining by Summit Corporation Limited. The Project Agreements, Power Purchase Agreement (PPA) and Implementation Agreement (IA) were signed with Bangladesh government for a period of 15 years and it began commercial operation on 12th July 2018. The plant is supplying power in the national grid at 132 KV through PGCB's Kodda grid sub-stations and located in Kodda, Gazipur about 30 km away from Dhaka city.